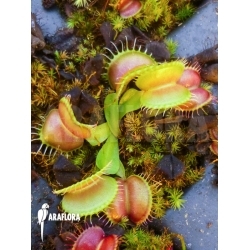 The Dionaea muscipula ‘Galaxy’ ‘Starter’ is the younger version of this Venus fly-trap mutant species. 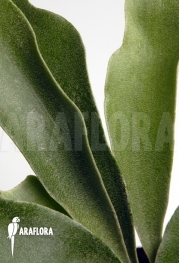 It is a fast-growing plant potted in its 5-centimetre container. The teeth of its traps are to some extent clustered at their growing point but will separate as the trap grows older. Probably even more spectacular are its exceptional short stalks on which grow traps in many different colours and shapes; comparable to the many types and sizes of the planets in our galaxy. Also the colours of a Dionaea muscipula ‘Galaxy’ ‘Starter’ are constantly evolving : if there is enough sunlight the traps can develop an intense red, almost purplish colour that will definitely make an impression not only on humans but also on insects.